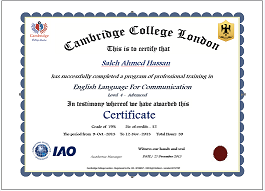 Students who complete any of CCL course program will receive a graduate credits from Cambridge College as well as a detailed CCL Certificate. It is your responsibility to check the level of English you need for the course you wish to take . If you are uncertain about your level, please complete our on-line test. Activation with next business day. You may make your payment to any of our Affiliates .